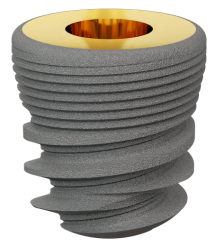 Classical ROOTFORM or ,,V‘‘ (tapered shape design) form dental implant with active thread (to ensure perfect primary stability) and internal conus connection (platform switching). The surface is SLA treated (Ca hydroxylapatite and Tricalcium phosphate are used instead of Al oxide!). The prosthetic platform (internal connection) is the same in all sizes of the implants! * According to the Decision No 768/2008/EC of the European Parliament and of the Council of 9 July 2008, ‘manufacturer’ shall mean any natural or legal person who manufactures a product or has a product designed or manufactured, and markets that product "under his name or trademark."